We caught up with the husband’s twin brother and wife; sharing food and stories. Laughs came thick and fast with our niece and her partner, we built new memories to last a lifetime. The sun beat down, dragon flies whizzed as stick insects sunned themselves in the bay tree; idyllic. We Sat under the sunshade together reminiscing as we stuffed our faces, laughed and dozed. A woodpecker hid inside the hollowed Apple tree. The days passed with a gusto we didn’t want to end. We packed up and drove on to Salcombe Regis, on Devon’s beautiful coast. You couldn’t ask for a better spot, sunny, green, clean and friendly, a few miles from Sidmouth. We arrived the day of the ‘underwear revolution’ in Colyton (see link). A news worthy story that made us smile for the rest of the week. Off to Sidmouth on the local hopper, it was so civilized and easy. We enjoyed wandering around the picturesque Regency seaside town. Back at the motor home, we familiarised ourselves with the layout, checked out the shower and toilet blocks, putting green and shop. There was a vigorous but pleasant stroll to the view of Salcombe hill and the sea. Morning arrived, overcast and breezy as Hurricane Hector’s tail whipped through. We chose to get ready and catch a later hopper, giving the weather time to calm. Off I strode to the nearest block. Most people had long gone, jumped on the bus for their day out; despite the weather ( as we Brits do). I however had choices to make, a wet room or single shower, a cubicle block, toilets with basins and even a bath. The facilities were superb, spotlessly clean, the water hot and it was … empty. Armed with bubbles and potions I chose the best space and I have to admit to feeling a tiniest bit smug. This was where I found myself in a difficult situation. To bypass any visual parts of my ablutions … I sum up by saying, my bag was dropped in a cubicle and I rested my cheeks to porcelain; next door. On the way in, I noticed the lock turned a couple of times before the latch closed. I ignored the fact that the lever dropped free and rocked as I released it. Both of the above should have made me aware that something was amiss. After a short sitting time, I used the beautifully scented hand foam and checked out the attractive smile of the older woman in the mirror; before moving on to the shower room. My hand wrapped around the lever and turned … around and around it went, my finger twisted & it spun the lever as if it was a feather. My sports strap alerted me to the rise in my resting heartbeat. My breath gasped, my hands became clammy and a pulse rapidly tapped in my neck. The bumbag that hung over my hip contained my meds, a phone, a change purse with a debit card and a hair grip. After a few seconds I shook myself and delved into the zips. Phone extracted I tried to call the husband; fifty yards away in the motor home. I stood on the seat with my four-foot eleven stature stretched to the extreme, trying to find a signal. No such luck, finding a phone signal in the countryside is hit or miss at the best of times. Inside a toilet block, in the most rural of spots in the west country is nigh on impossible. Now serious stuff came into play! With all the prowess of an Enid Blyton famous five character I thrashed out a plan. I set the WiFi to search on my smart phone. Soon it offered to sell me WiFi from the campsite. With the debit card extracted the purchase of WiFi complete, I sighed with relief. I sent a text to a friend via Facebook’s messenger. HELP. LOCKED IN LOO. Phone Jay urgently PLEASE. I pressed send as the light in the lavatory timed out. Clutching a hair grip between my thumb and index finger, I poked as I twisted the lever, I shoved, rammed and scraped about in the vicinity of the latch by the light of my phone; which was clasped in my mouth. I had been incarcerated for fifty minutes! My sport’s strap vibrated and fireworks went off, it obviously believed me to be vigorously exercising. With the battery on my phone now showing five percent I had to move fast. Logged on to Face book I found the campsite page friended the site and sent a private message. Help! Plot 153 locked in toilet. Send! Help. Next I emailed my brother-in-law. Please. Help. Phone Jay. Trapped in the loo. The screen went off just after I pressed send, the room was in complete darkness now; my battery flat. A second blind (pardon the pun) attempt with the hair grip eventually bore fruit. By now I had been in the loo for an hour! My bladder was swollen, my cheeks damp and my grip ruined as I rushed out and towards the motor home. I thought to sympathy and maybe a touch of pride at my ingenuity. I heard the ringtone on my approach, then the unnecessary laugher. Soon I looked into the eyes of a very jovial husband. One who pressed his Samsung closer to his ear as I passed him. Relieved to be relieved of the contents of my bladder in the safety of the motor home … with my foot used as a lock on the door. Only the music emanating from the other side of the door was to puncture the relief I felt. Standing tall (as tall as a four-foot eleven woman can) I walked past ‘The Husband,’ I pushed the charger into my phone. Bleep bleep! My friend answered with ‘are you free yet? My brother-in-law howled in unison with his wife on speaker phone. All the time … ‘The Husband’ sang along to, “Oh dear what can the matter be, three old ladies were locked in the lavatory” whilst wrapping his arms around his aching ribs and wearing the most ridiculous grin. Once composed, I walked to the reception, reported a faulty toilet lock. Numerous apologies later and the promise of fresh croissants to soften the edges of ‘The Escape.’ I found my own funny. Shhhh! *whispers* We won’t let on at least for a while *Huge grin*. The news link from the telegraph UK. (the link in above text). The Enid Blyton vintage first edition cover lifted kindly from the internet. Have you ever used a book you read as a child, for such a good reason as I … ? Leave me something to smile at in the comments, I just love to chat. press to join in. 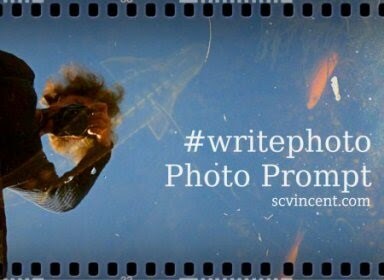 Sue Vincent’s picture prompt. Here is this weeks photo. All.entries to be in by March 22nd. 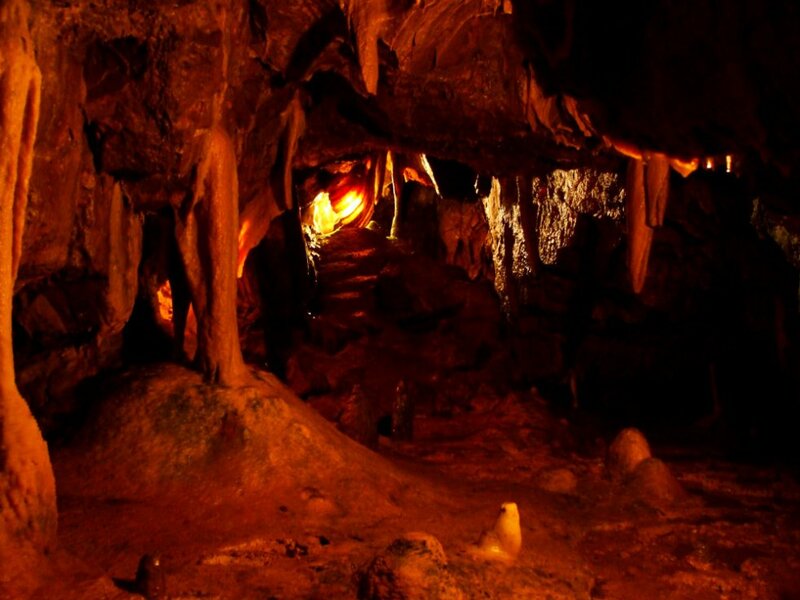 Stalactites hung like chandeliers from the roof of our cave, the formation split it into two rooms. Since his leaving I had made it welcoming, sweeping the animal waste in a pile, hanging a lantern from a root that pierced the ceiling. The rosy welcoming glow was encouraged by the minerals in the rock that cast a sunset; perfect for this night. Animal skins shone silver on the vine that provided cover. My heart bounced in my chest, as his shadow fell on the ridge. I trembled and perspired at the shape of him. Picking up the mewing bundle I stood at the entrance and thrust it towards his broad chest and said… “Your gift” With his huge hands he twisted the neck, a crack of splintering bone was heard. A gasp left my throat and I wiped my eyes with trembling fingers. With swift strokes he skinned and gutted it, throwing the debris aside. Taking me roughly in his arms to the inner chamber he reminded me what we were together for.The calf spat and cooked on the fire as we writhed on its soft skin. Now I was his, I had successfully filled his needs and his belly . My idea for this came from here go check out her blog and handsome decoration. Lindsey left a question on a post yesterday, asking “what is your favourite Christmas decoration and why”. I thought about the Xmas pud my daughter made at four and the Santa boot my eldest made some thirty years or more ago. The snowflake, it was from my youngest son all white and sparkly made when five; I remember them well, their memories are the ones I treasure with a motherly equality and a sadness when each year I find them gone. 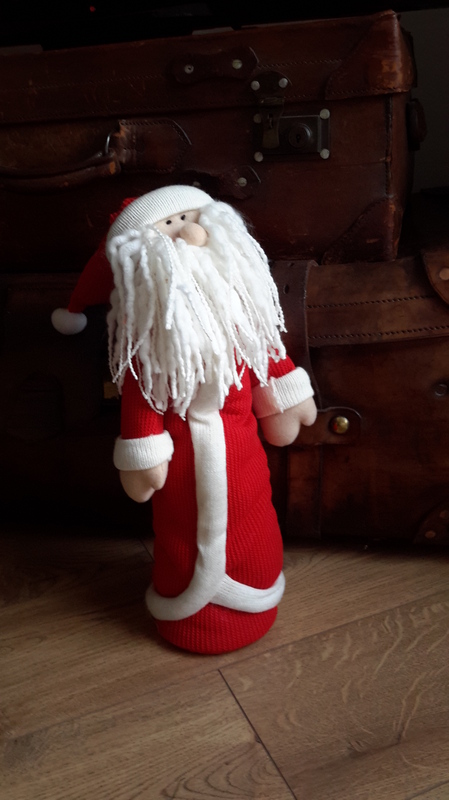 The jointed Father Christmas who has pride of place stands two foot tall, he was my own first decoration. My daughter thought I’d like him as I had left so much behind; the beginning of a new life new Christmases to come. But my own favourite, the one chosen by me… the me I am now, the one I purchased and placed here that is my best. An angel in a red coat with sparkles on her wooden wings dark neat painted hair with a gold halo and a heart shaped cross body bag. I purchased her at a pop-up shop; a locally crafted display of all things Christmas. My visit was a surprise as I didn’t know it was there… it just popped up. She silently called me, at one point I do believe she winked; that part could be put down to artistic licence *sniff* but none the less drawn we were. At first, I stood her alone in the picture window facing the outside world, when I re-entered the room I turned her facing us. I have had her ten days now and we are getting the measure of each other, up to now she has been the only Christmas adornment to our home but today I will decorate the tree. And my scarlet angel will find her place as I have mine. After Christmas, I may swap her heart shaped bag for a muff and make a fluffy headband to hide her halo but the wings elude me, maybe a classy fabric draped like a wrap to gently secrete them out of sight. I could put her betwixt my books in a bookcase to watch over us when Christmas has gone. I am not sure why I have become so attached to my scarlet angel but there it is; I am naming her as my favourite Christmas decoration. What is yours? And why? Leave me a comment or just let me know what you think… And Merry Christmas. A Little Wind Wreaks Havoc. Thank you Sue Vincent for this weeks picture prompt go 🔜here🔙 to join Thursdays #writephotoprompt smoke. A strange smell hung over the village it had done so for most of the summer; bad eggs, that’s the nearest I could Identify it as. Mornings around ten O’clock it was at its worst, and if the summer breeze wafted your way you knew it. People stopped hanging their linen out and they kept the windows firmly shut. The local shop took a bomb of money selling airfreshners, scented oil bottles the expensive ones with reeds. When they had a huge delivery of oscillating fans, which incidentally sold out in two days; suspicions arose. Fingers were pointed directly at the village postmistress who was the only one not complaining, and the only one rubbing her hands together behind the counter in our village store. Emergency meetings were held in secret down the allotments, neighbourhood watch was only watching one place. Only Farmer Longstockings was unbothered, he said “country folk should be used to country smells” refusing to join the village folks scuttle butting and finger wagging. Farmer Longstockings was now suspect no.two. I loved it when folk came up to bluebell woods to gaze on the blanket of colour that spilt down the bank and mingled with pink orchids. Groups of camera clutching walkers kissed by the sun and happy to be part of a flora and fauna celebration. I made scones and best home made jams, we sold them at the village hall, the monies raised paid for the party at harvest festival time. Several of us took part bringing sandwiches pasties and bottles of chilled cider. Some of the lads would charge three pounds to take them to the woods, they would give an elaborately expanded story on how they came to be. But this year our month of lucrative money-making seemed to be in jeopardy. The scout group were making stench masks to sell when the visitors arrive, some bought up the dolly pegs from the shop and became peg wearing investigators with bandannas over their mouths. It wasn’t long before the scoutmaster took badges away for scaring the three pensioners in the Almshouses… No. Three on the suspect list. Farmer Longstockings had spotted me, I watched him turn the rusted tractor in my direction, now I was… concerned, but as I was almost an adult I straightened my back and ploughed on. Philip had spotted the smoke trail and guessed that maybe his ole snout was so used to stink that he could no longer smell, but his eyes made him suspicious. We arrived at the same time “Farmer Longstockings” I nodded my head and planted my feet with a stomp. “Philip! yer too long in the leg to not use my given name”. He pushed his hat to the back of his head, wiped his eyes with a bit of scrim, they were streaming as he gazed up at the gentle wisps emanating from ten feet above us. “This is no task for a young lady, you go see the missus an tell her to send Toby with the big chains”. Off I went pleased to get away from the vomit-inducing stench. Toby was the Longstockings son that hadn’t seen me since I was a child. He must be home for the summer, he’d been away at horticulture college for two years and the thought of actually seeing him made my heart beat most peculiarly. Ann wasn’t as pleased to have me disturbing her chores and didn’t relish me talking to her son; that much was apparent. Three hours passed before they returned, wet, dirty and very smelly. 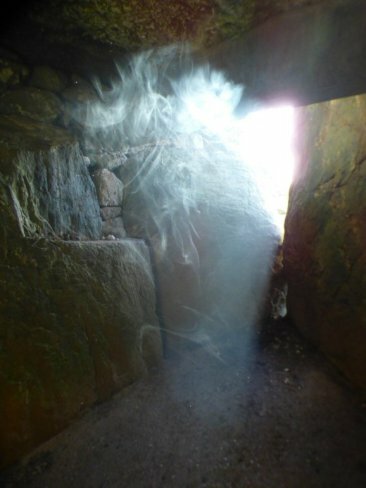 They had capped the opening to stop the escape of sulphuric smoke that came from way beneath the earth. Philip phoned a geologist who would work with him and supervise the fitting of a permanent plug. Together they’d make safe the cave over the next few weeks. Before I left we had agreed that less said soonest mended would be the order of the day. Bluebell month was glorious, and a new romance blossomed between Toby and me. That Summer I filled my bottom drawer in preparation… items purchased with monies earned from my book. The Tale of The Last Dragon. The story came about one summer’s day when a little wind wreaked Havoc. Microfiction challenge #15: Freedom. The Beauty Of Emmeline. 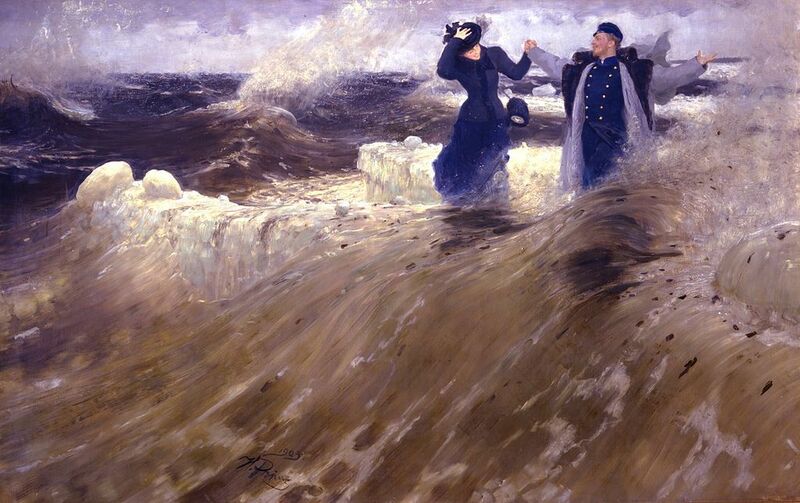 Emmeline took Earnest‘s hand and with a gentle tug she walked him into the surf. Holding his arm aloft as if in dance. His face lit up, his nose twitched as he inhaled great nostrils of sea air. Each step he took brought a new experience. Each Gull he heard was to him an orchestra and so animated was he that Emmeline could hear it too. Earnest was lost for words his senses were full to bursting, the feel of sand betwixt his toes; the exhilaration of salt spray lashing his cheeks, his ears so attuned to the mighty oceans roar; he trembled. Emmeline smiled, a tear joined the spray upon her lashes, and she knew it was worth the ruined shoes and sodden hem to see his face. Earnest threw wide his arms, ripped the fastenings from his great coat and cried. “As God be my judge, I am humbled to be a blind man, for never could a sighted man see more than I this day”. Emeline’s adventure paid off for once, her forwardness was not out of place. Together they would grow old knowing there was nothing that Earnest couldn’t see… including the beauty of Emmeline. We are using one of Ilja Repin’s paintings. This is my response to the prompt, press Jane Dougherty to join in, connect with many great blogs and read some super stories. How did I do? Did you believe in Emmelines story? Leave me a note I will respond soonest; once I’ve changed from my wet shoes *wink wink*.